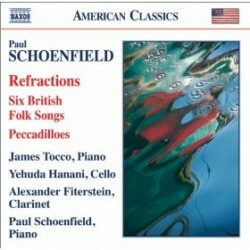 Paul Schoenfield's music blends accessible modernism with sophisticated wit built on a solid foundation of popular, jazz, and Jewish sources, all of which are in evidence in this splendid recording of his chamber music. 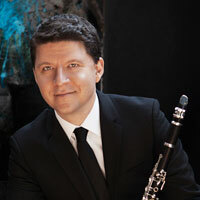 The title piece, Refractions, is a trio for piano, clarinet, and cello, its four movements based on music from Mozart's The Marriage of Figaro. But the work doesn't follow the familiar pattern of paraphrase and variation; rather, as the title suggests, it's a convoluted take on the opera's arias and recitatives, the source references often barely discernible even to knowledgeable opera buffs.